Day one: We had been talking off and on about getting a kitten for some time. We realized that there were very few times in our lives when we'd ever had a kitten. Although we dearly love cats, most of our pets have come into our lives fully grown, many of them well into their sleepy years. The notion of a frolicking, playful kitten around the house appealed to us. 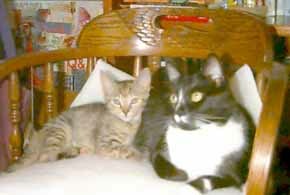 We thought it would be good company for our grown-up, rather aloof cat, TC. This time out, we wanted a lap cat, one that was willing to display her affection freely. So we went to the local animal shelter. First Dale called them. Yes, they had a few kittens but they couldn't guarantee there would be any left by the time we got there. We hurried. We found out that perspective parents have to take a number when you arrive, fill out some rather personal forms about your parenting skills, and go through an interview with a kitten social worker before you can choose one to take home. around humans. 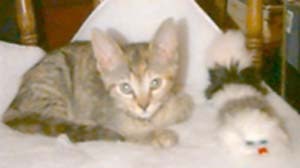 The kitten seemed very frightened, with big ears, fraidy-cat eyes and ribs showing under her soft fur. We'd take her. They wouldn't let us have her right away though. First, we had to pay $60 to have her spayed and wormed and given her shots, poor thing. Day two: Early the next morning we made a run to Petco (where the pets go), to get some kitten stuff: a bed, a cat carrier, a scratching post, some food and food bowls, some kitten toys and a baby gate. Our kitten social worker recommended that we keep her separated from TC for 10 days at least. They would need time to get acquainted. If not, we might spend the rest of our lives with two cats living in separate rooms under the beds. We'd do it their way. We set up the guest room as the kitten's private domain. Of course she headed under the bed right away. But she was hungry so we easily lured her out for a nice bowl of Friskies for kittens. Since TC loves Friskies Ocean Fish and Tuna Dinner, we thought we'd try the kitten out on that one. It worked, of course. She was very hungry, even tho she was still groggy and staggering from the anesthesia. After she ate we took turns lying on the bed with her. Apparently she loved it. She started purring up a storm. We were a little worried about the litter box. Did she know how to use it? She ignored it and when we left her she slipped under the bed and spent a very quiet night there. Day three: We decided to name her Too! 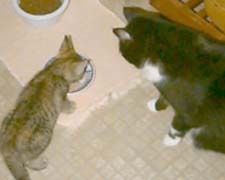 When we fed the cats, TC wouldn't eat, but the kitten was hungry and then ready to play. We tried out all the new toys. She especially loved the flying mouse with the bird feather tail. She jumped onto the top of her scratching post and scampered around the room. She purred and frolicked around, just like kittens do. Then she used the box. Yeah! Day four: Karen came over to visit the kitten. TC welcomed her as usual, because Karen was her first owner. TC watched carefully as Karen played with Too. Then Karen played TC's favorite game. TC even worked up a little appetite. Things were going to be okay. Day five: This was the day Too could have a bath. I was eager to give her one because she brought fleas home from the pound (at no extra charge). But we had to wait for five days for the stitches to heal before bathing her. TC watched as I bathed Too, mainly because she was putting up such a fuss that she woke TC right out of her morning nap. The bath went well enough and I hope I got all the nasty little fleas off of her. She shivered and then purred as I brushed the last of the water out of her soft kitten fur. For the most part TC ignored the whole proceeding after figuring out what was going on and realized she wasn't going to have to participate. Day six: Too has climbed over the baby gate twice now, so Dale had to tape a big piece of paper over it so she won't have any footholds. She's unhappy about that because she's ready to come out and play. TC spends her mornings on the other side of it just watching her. I've even caught them touching noses when they think I'm not looking. larger than her new toy. After Too calmed down a little I took her into my office and she slept on my lap for an hour or so. TC took her place on top of the scanner and everybody settled in just fine. Then Too explored the office, including the bookshelves, the back issues of Clever, the files, all the cords, the computer, the printer, the wastebaskets and the closets, the chair legs, the pencils, my feet, everything in the office needed the once over. Kittens are very busy. Day Seven: We can't stand it any longer. The kitten wants out of her room. She's developed a plaintive meow that none of us can stand. Even TC gets unnerved by it. So, down came the baby gate and out came the kitten. She simply took over the house and TC. Day Ten: Every day the kitten becomes more confident and playful. This morning she woke us at 4:30 am ready to play. She crawled up onto our bed and jumped on our feet. She found TC under the covers beside me and walked over her. We all finally had to get up and feed her. Then I gave her one of those very small mice to play with in the dining room. She loves to play in there because her toys slip so nicely on our hardwood floors. She also likes to climb around the dining room chair legs. Both cats played in there for hours. Day Fourteen: We've had Too for two weeks now and she has completely taken over our house and our hearts. Even TC loves her (well, sort of). They play together, and sleep in the same room. TC licks her and Too plays with TC's tail. They both play mouse together. I've purchased every tiny mouse I can find. They lose them quickly or else hide them around the house. Who knows where they go. She has become part of the family now. She found a good home and we found a new pal. TC & Too -- Pals! Here's a list of things we didn't really need to buy: 1) A bed for the kitten. She sleeps everywhere. She has taken over TC's favorite places like the window sills, the chair beside my desk, the dining room chairs, TC's favorite pillow. 2) Scratching post. Too prefers the floor mat next to the door. 3) Her own cat bowl. Both cats now eat out of the same bowl. 4) Separate litter box. Ditto. Here's a list of things we need more of: those tiny catnip mice that come 3 or 4 to a package, more kitty litter, more cat food, one more cat carrier. 1) The Humane Society -- they really do know a great deal about training pets to become wonderful companions. They are remarkably patient and eager to help the little stray animals find good and loving homes. 2) Our vet for giving our kitten her first checkup, free of charge. Many vets do this by agreement with their local animal shelters. 3) Petco for having everything a new pet needs, and an eager staff ready to answer any and all questions. 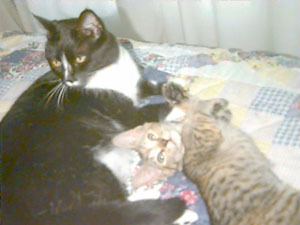 4) And of course, our family, for being cat lovers and future baby sitters.